The Bedni Bugyal ranges are the most impressive part of the Himalayan valley. 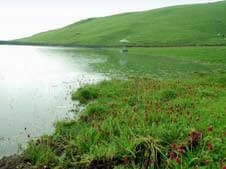 It is one of the most impressive alpine meadows located in Uttarakhand. Ali and Bedni are the twin ranges of the meadows which simply lying on the famous routes of the Roopkund trek. Bedni Bugyal trek consist of virgin forest, gurgling brooks, breathtaking campsite, miles of undulating meadows and Mt Trishul and Mt Nanda Ghunti talking over them. The undiluted nature's wonder at the lap of Garhwal Himalayas Is the most fascinating impressions of camping in Bedni Bugyal. From Lohajung 8300 feet in the heart of the great Himalayan range, 5 kilometre from Karan Prayag, the trek of Bedni Bugyal starts, which leads to the descending trail through mixed forests to an iron bridge across the NeelGanga river. The real trek start after crossing river,which is then switched to a small village ( Didina) and the best camping site in Garhwal ranges, and then raising towards the twin meadows of Ali and Bedni Bugyal makes a great start. Garhwal himalayas can best be experienced at the steep switch back climb through the dense oak forests which can be the real adventure. Once the trekking is started through the forests, the brown carpet of leaves marks the trail and the sweet smell of moist earth just lingers around. Camping in Bedni Bugyal will take you finally to leisurely walk of 5 kilometre where you can take off your shoes and allow yourself to feel the carpet of grass under your feet. In the morning after breakfast drive to Mundoli via Devprayag, Rudraprayag and Karnprayag. Arrival at Mundoli by evening. Dinner and overnight stay in tents. Back to your Next Journey.